Now is a time for marketing professionals in home building to stand up and exert some positive leadership to help our builders find a sustainable path forward to prosperity. This article is a call for action and a recipe for us to do just that. The money in homebuilding is in marketing, including for this discussion, its sub-set of sales. Everything a building company does except marketing is fundamentally intended to create value. It is a terrible paradox of our business is that the value builders create has no value. Too many builders founder with lots of value sitting out there in the field. Look around. What every building company really needs is revenue, because only revenue allows builders to pay their bills, pay themselves and keep their company afloat. Marketing is the function which converts the value builders create into the revenue they must have. How is it, then, that marketing doesn’t lead as many homebuilding companies as it should? I have an idea it may have something to do with the diagram pictured here. A love of Construction draws many builders to build, and why not? Building is very satisfying. What’s built is big, tangible and noble. Homes are art in a funny way. Most builders I’ve known take great pride in what they build, as artists would take great pride in their art. It’s good that builders have this motivation. Next comes a need for Control; counting things and being accountable. If there is to be a business building homes, this function must take place. Because it is so important, there are lots of educational opportunities builders can participate in to learn the critical skills of business management. All good, also. Yet, without Customers, Construction and Control have no meaning. The Wheel makes it obvious, but it was pretty clear all along, wasn’t it? 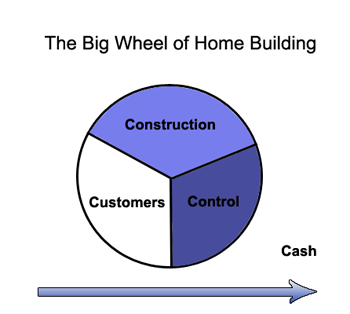 Nobody gets into homebuilding without realizing customers are indispensable. It’s just that in real life, customers can be tricky. Dealing with customers is a lot different from managing construction or managing a construction business. Special skills are needed. Sometimes, it seems those special skills come in people who themselves are pretty tricky. That’s us, folks. Is it any wonder it’s sometimes a challenge for builders to connect with customers and connect with us? After all, customers often criticize the art and always want a lower price. Hardly endearing. And to some, we marketers seem to care more about what’s in it for us than for our principals. The absolute worst is when I hear a builder say, “That agent left the closing table with more money than I did, and I built the house!” There is a way out of this trap, and fortunately, the answer lies within our skill set. We have a chance, right now, to show how skillful marketing can increase profit margins and sales volumes at the same time. Think what that would mean for our builders! People need a reason to buy one comparable product instead of another. Forces beyond anyone’s control condemn competing new homes to be very similar. What many builders perceive as huge differences in their homes, customers struggle to see and mostly don’t care about. When customers perceive little difference between alternative homes, they naturally turn to beating up builders on price to create a preference they can act on. This is not good for margins. Every builder I’ve ever met builds a quality product. But, the room gets real quiet when I ask them to describe five specific elements of quality they build into their homes which are not typical among their direct competitors. If they could do that, we marketers could romance those five specific elements of uncommon quality into solid reasons for customers to prefer one of our homes, and even better, we could persuade customers to pay a premium to own what they now perceive as a home of superior quality. So marketers, get busy persuading your builder principals to show you, or create with your help, those five specific elements of superior quality. Explain how critical it is to have positive product differentiation in order to attract buyers and deflect their price gouging. Resist the drive to win with cost-gutted, code-minimum houses. There is a future in your market for only one low-price provider, and it likely isn’t you. When you’re set with your five, merchandise the squat out of them so that no visitor to your place of business (be it sales office or website) can ever again fail to get the message and feel its power. Script out what I call 2 Minute Drills on each quality point. If kitchen cabinets are one of your positive differentiators, train your salespersons to give you 2 minutes on kitchen cabinets at the drop of a hat. Until they can do that persuasively and without hesitation, you will be missing sales and letting your builder down. Once you’re up to speed on quality differentiation, give yourself a pat on the back and resolve to up the ante. When we talk about quality in homebuilding, we’re talking about what my economist friends call utility value. Utility value has to do with what a product is, how it’s put together and what it does. Until you intercede to upgrade it, the utility value of new homes is that they keep the rain out, the kids in and provide a place to put stuff. But, once you start romancing your five elements of superior quality, you will be building solid brand power for your builder. A brand is nothing more than a promise which the public understands and appreciates. You could do worse than to establish your builder as your market’s quality leader at your price point. And, now, with your five, you will be able to back it up. Sweet! Mega-marketers the world over understand that as important as utility value may be (high quality, in our instance), emotional value often trumps it as inducement for customers to prefer one product brand over another. Emotional value has to do with what the ownership, use and/or display of your product would mean to customers, not what your product is, how it’s put together or what it does. Think of that really heavy, brand-leading Swiss watch, as an example. You know the one I'm talking about, don't you? Is it a high quality product? The answer would depend on what your definition of quality is. (Thank you, Bill Clinton.) If accuracy in keeping time defines quality, our really heavy watch fails. But if our definition of quality is the intricacy of its mechanical design and the precision of its parts, then our heavy Swiss watch would be a very high quality product indeed. But ask yourself, why do the people who buy that watch seem so eager to spend a thousand times more to own it than they would have to pay for a more accurate timepiece at the nearest drug store? The answer, almost certainly, is prestige. Ownership, use and/or display of that watch carries with it a fantasy that the rest of us will be impressed. We may or may not be, but that doesn’t matter. What matters is that purchasers of that watch believe in the fantasy and even more, are certain they will be impressed with themselves. Spending the extra money is actually part of the reward. How cool is that? Getting people to line up to pay a premium. If only we could do that for our builders. Ah, but we can.